The Australian Centre with the Faculty of Arts announced the winners of this year's literary awards at ACMI during the Melbourne Writers Festival. The event was hosted by Professor Ken Gelder, Director of the Australian Centre and Professor Denise Varney, Dean, Faculty of Arts. Provoked by William Blake's illustrations to Dante's Divine Comedy, the poems from Kinsella's On the Outskirts are the stirrings of an exemplary conscience in terms of both their craftsmanship and visionary intensity. In a lyric sequence that spans the distance from "the winter fogs of Coondle" to the flooded banks of the Neckar, Kinsella preserves moments of grace from the relentless pressures of accumulation, despoliation, and self-delusion that portend environmental catastrophe. 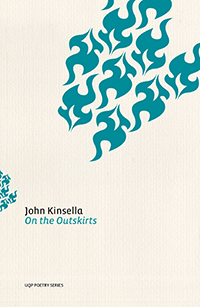 Like the blackbirds nesting along the Ammer about which Kinsella writes so memorably, these poems are "rowdy, rapturous, agitated, downright territorial, loaded, passionate." "I am delighted and grateful that the judges have chosen these extracts from On the Outskirts (UQP) as the winning entry. In this work, I have attempted to create 'conversations' between politics, ethics, 'art', and 'place', that are bound together by poetic form, but not constrained by that form. In this book, I express the belief that cause and effect are implicit in all we do - that if we ignore the damage, we are contributing to the damage," said John. 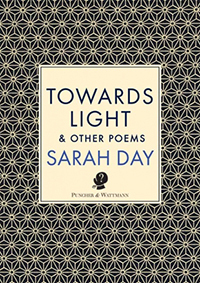 In her eighth collection, Sarah Day shows a quiet mastery of poetic form, recalibrating rhythm and rhyme scheme to register the tremors of everyday experience that point to more seismic shifts of feeling, affiliation, and identity. Water and air are the elements from which Day composes her visions of light and flight. In her poems, words are restored to their original powers of illumination and elevation. Like the lyrebird in his opening poem, Michael Farrell manages to be the most prodigious of verbal mimics while remaining scrupulously himself. The poems in I Love Poetry work their mischief through a seamless inadvertency that nevertheless has the reader stitched up by the end. Sharp yet self-effacing, Farrell's poems make the persuasive case that an appetite for all aspects of contemporary experience may just be a characteristically Australian thing. 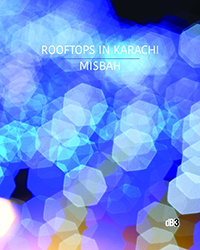 A composite of poetic fragments in prose, Misbah Khokhar's Rooftops in Karachi weaves deftly between fable, memoir, and reportage in evoking the contested zones of home and self in the aftermath of displacement. Juxtaposing childhood transgressions with wartime atrocities, Khokhar's prose poems explore the precariousness of life under partitions, whether physical, political, or cultural. Poignantly reticent, these fragments are not so much ruins as tokens of survival. 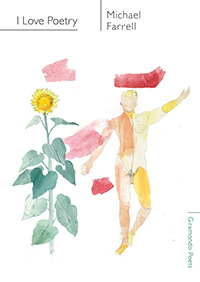 The prestigious Wesley Michel Wright Prize in Poetry is open for award to an author or composer of original verse or poetry in the English Language and who is an Australian citizen. Judges: Associate Professor Justin Clemens, Dr James Jiang (School of Culture and Communication, Faculty of Arts, University of Melbourne), Dr Tony Birch (Moondani Balluk, Victoria University). "I would like to express my heartfelt thanks for the Dinny O'Hearn Fellowship for 2018. Institutional support means the world to writers, who are often atomised and isolated. Fellowships like these make us feel that we are valued, heard, and supported, and encourages us to keep going. This scholarship will provide me with vital financial relief while I work on completing my short story collection, as well as the opportunity to spend some time in Melbourne, which should enable me to conduct research highly pertinent to the manuscript," said Eda. "Growing up working class in Western Sydney, and the child of uneducated migrants, it is also a unique pleasure for me to feel that I might be capable of contributing to the Australian literary tradition in my own small way. Completing and releasing a book is something I have wanted for as long as I can remember, starting way back when I was a five year old girl, dressed in my green and gold uniform and devouring all the books in the library at Marayong Public School (though it sounds trite, it is very true!). I sincerely appreciate the generosity of this fellowship, and hope it can propel me to finally accomplishing this goal in the very near future." VCA playwright Kim Ho's Panacea: Or: The Very Real, Definitely Not Falsified History of Lasseter's Reef delves into a mythological Australian story of gold and greed and the hunt for a fictional reef of gold. The play refers directly to the purported discovery, announced by Harold Bell Lasseter in 1929 and 1930, of a fabulously rich gold deposit in a remote and desolate corner of central Australia. The judges felt that Kim Ho's play script fragment despatched clichés of larrikin mateship and unrealisable colonial dreams of getting rich fast with great parodic verve. The sharp, economical dialogue was also commended as a writing technique bringing this post-federation history of failure and deception alive. The judges commend this outstanding, humorous and insightful work of postcolonial theatre. Established in 1994, the DJ (Dinny) O'Hearn Memorial Fellowship is a biennial award that offers a residency at the Australian Centre, University of Melbourne, to a young Australian writer of fiction, poetry or drama. The fellowship was set up to honour the memory of the late Dinny O'Hearn, one of the founders of the Australian Centre, and a tireless enthusiast for Australian writing. This evocative and touching memoir turns back to Fotouhi's father to chronicle his struggles with education, in particular his determination to learn English 'which expanded his world'. Eventually, her father becomes global and diasporic, working in New York, Los Angeles, Japan and Hong Kong. Returning to Tehran, her family is part of a cosmopolitan Iranian middle class. But then her father leaves for a banking job in Kabul in Afghanistan, ruined after Soviet occupation and Taliban rule. This is a beautifully written memoir about local traumas and predicaments, pitching them – often uneasily – against global movement and an increasingly cosmopolitan self-awareness. "I would like to sincerely thank the judges, the prize organizers and donors for providing the opportunity for this work to reach its potential intent. I have been extremely privileged that over the years I was allowed to glimpse into life in Afghanistan in a way that many in our world would not. I have been burdened by a deep desire to share this perspective of this beautiful country and people, a place that shifted my soul, my heart and my entire being as a woman." "The intention of this work has always been for it to be something beyond me, for me to be a medium for raising awareness and sharing from a heartfelt space. Recognition through this prize gives me hope and makes me feel that I am a few steps closer to reaching my goal. However, in this work, I owe all that I have to the people in Afghanistan who opened their hearts and souls graciously to share. As a token of appreciation for this I will be sharing a part of the prize money with those who made this possible," said Sanaz. In this extract, various unions - the Maritime Unions, the Builders Labourers Union, the Painters Union, and the Metalworkers Union - gather together in support of the Nicaraguan revolution during the Contra War, which ran through most of that decade. Ethell's memoir gives us a sense of the international solidarity of Australian unions during this time, when the notion of 'solidarity' in this context truly counted for something. It also captures the bleary-eyed excitement of global political networks, as these young unionists travel to Moscow, Cuba and Nicaragua. Characters are beautifully drawn: for example, the biker-turned-union member Ernie Barnard, 'one of the few drug dealing standover men to become an activist in the peace movement', as Ethell puts it. Ethell gives us a fine portrait of a time of grassroots activism and commitment, in what we hope will be a fascinating publication to come. The Peter Blazey Fellowship was established to honour the memory of Peter Blazey - journalist, author and gay activist - and has been made available through the generosity of Clive Blazey and Tim Herbert, brother and partner of Peter Blazey. Blazey was born in Melbourne in 1939 and worked for the Australian, the National Times and as a regular columnist for OutRage magazine. He published a number of books, his personal memoir, Screw Loose, appeared after his death from AIDS in 1997.